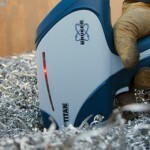 Entry level XRF metal analyser now with a large area SDD featuring SharpBeam technology and built in Titan detector shield. This model represents excellent value when requirements for testing include Positive Material Identification, Precious metals and Scrap recycling. Weighing just 1.5KG with batteries and with a new ruggedised body certified to IP54, and long battery cycle (8-10 hours depended on use) and over 500 alloys preloaded in its library.With two years manufacturers warranty the Titan 500 offers the best unit option when budget impacts on model selection.